Here are some photos from the Minneapolis Mini-Comics Day event at the Minnesota Center for Book Arts in Minneapolis. Thanks to everyone who participated! Many delightful and ambitious mini-comics were made… you can see pictures of some of them below. Thanks also to the Minnesota Center for Book Arts for being such fantastic hosts, and to Wet Paint for bringing the wonderful art material sample bags for participants! Go here to read Nick Straight’s wonderful untitled mini-comic. If anyone else from the event posts their comic online, let me know and I’ll get it added here. Hello, folks. Felipe 5 Horas here. 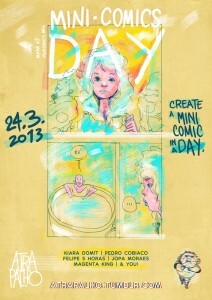 I’m here to talk about Atrapalho Comics, an internet based Brazilian comics group that is going to participate on the Mini Comics Day. Yey! Our amazing poster, by Magenta King. It’s almost midnight in Brazil, which means that we are going to start drawing soon. 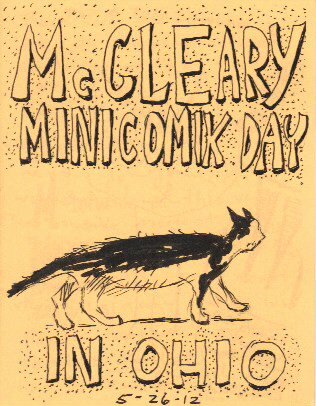 Mini-comics pioneer Steve Willis (creator of the longest running comic series of all time, Morty Comix, currently at issue #2370, available only at an abandoned phone booth) organized a great-sounding Mini-Comics Day event in McCleary, WA. Here is Steve’s overview of the event (note: you’ll want to follow his blog, as it is immensely entertaining). Here is Jim Gill’s report on the event. Here is Paul Tumey’s account of how things went down. You can see all of Steve’s Mini-Comics Day posts here on his blog. Also, Bruce Chrislip somehow managed to participate in the McCleary event all the way from Cincinati, Ohio! Thanks again to Big Brain Comics and the Northeast CDC for providing the cool prizes (a $25 gift certificate to Big Brain and a pass to the upcoming Northeast Ride happening June 2nd, respectively). Mini-Comics Day in Minneapolis was a whole lot of fun… of the numerous cartoonists who showed up, at least 15 comics were completed (pictured below… apologies if I didn’t get a photo of yours for some reason). Afterwards we went to Grumpy’s to drink, eat tater tots, and give out the 2012 Stapler Award for the Best Minnesota Mini-Comics Day Mini-Comic. Eric Lorberer (Editor of Rain Taxi Review of Books), Courtney Algeo (Editorial Director of Paper Darts and Marketing Coordinator at The Loft Literary Center) and Miles Johnson (of the Read My List blog and Altered Esthetics gallery) deliberated for quite a while to determine which mini was the best one by their subjective standards… and a winner was picked! The award went to Athena Currier for her very deserving entry “My Little Sister Phoebe Just Graduated from College,” which made me laugh out loud when I read it… I wish I had remembered to take a picture of her with the award. 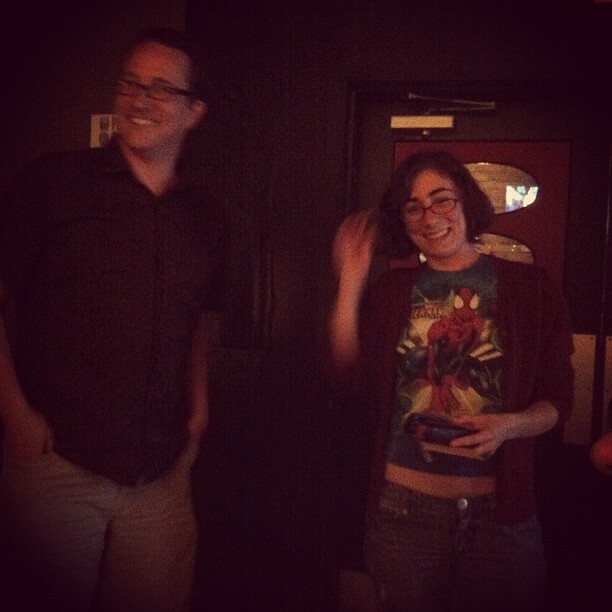 Additionally, last year’s winner of the Stapler, Dan Murphy, was given an honorable mention for his entry “The Spider Lady,” which was good, because if he had won we would have had to change the name of the award to the Dan Murphy award. Here are some (bad) pictures from the event, and pictures of the completed minis.